Musk: Tesla pickup could have "gamechanging" feature. Tesla Inc. will build a pickup truck soon after producing electric crossover vehicle Model Y, CEO Elon Musk said on Tuesday. "I promise that we will make a pickup truck right after Model Y. Have had the core design/engineering elements in my mind for almost 5 years. 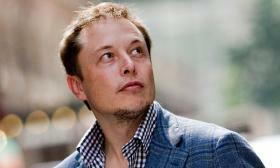 Am dying to build it," Musk wrote in a Twitter post. "Similar total size. Maybe slightly bigger to account for a really gamechanging (I think) feature I’d like to add." The Model Y, to be built on the same platform as the Model 3 sedan, was tentatively scheduled to begin production in mid-2019, Reuters reported in June. The electric vehicle maker first announced plans for a pickup truck last July, alongside a "master plan" to develop a commercial truck, a public transport bus and a compact SUV. Musk had said in April that the pickup truck would be unveiled within 18 to 24 months.